Updated Thursday August 27, 2015 by FABA. Amazon Smile is a charitable giving program from the internet's largest retailer. It allows you to select a charity and 0.5% of all of your purchases will automatically be donated to that charity. Today, FABA registered with this program. This means that you can now support youth baseball in the Fleetwood area while you shop online! Using Amazon Smile is simple. Instead of going to "www.amazon.com", go to "smile.amazon.com". From there you can pick a charity to receive your donations. 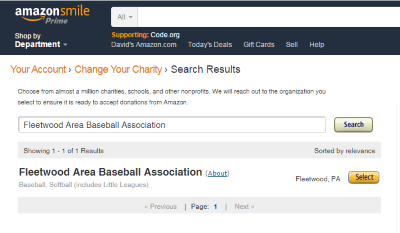 Do a search for "Fleetwood Area Baseball Association" and we will show up. Once you've selected us, all of your qualifying purchases will result in donations to FABA. Now you can support FABA's mission of providing the youth of our community with structured baseball programs that teach baseball skills, inclusiveness, fair play, sportsmanship, and competitiveness all while you shop online. That's a win win if I ever heard one.